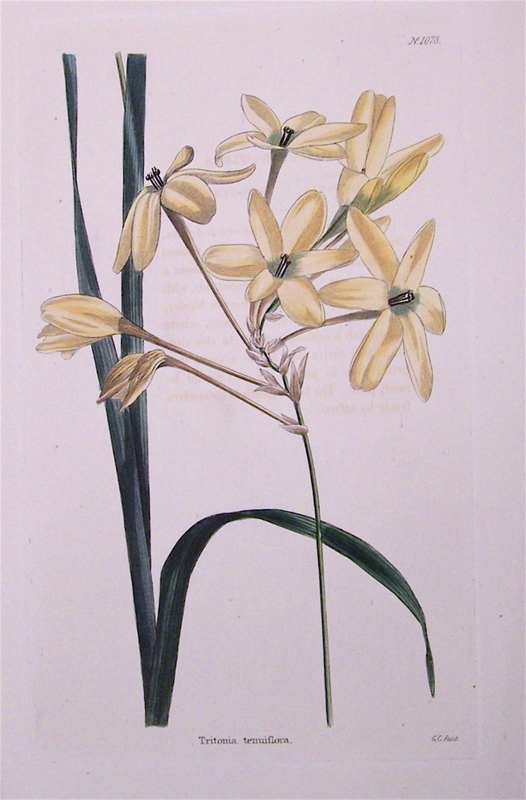 For discussion of the species see Ixia paniculata D.Delaroche. Tenuiflora means with slender flowers although there appears to be very little difference in this respect between flowers depicted as tenuiflora, such as here, and others of the species. ‘This is a very pretty bulbous-rooted plant, from the Cape of Good Hope. 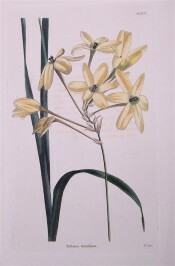 It flowers in May and June: the stems are about a foot in height.’ [LBC no.1078/1825]. Tritonia tenuiflora was Introduced to Britain in 1811. [JD]. Listed in the 1845, 1850 and 1857 catalogues [B.434/1845]. In Macarthur’s possession since at least 1844 as bulbs were sent to Wm. Macarthur Esq. in February of that year. [MP A2948-3]. Morphixia paniculata Bak. var. tenuiflora (Ker-Gawl.) Bak.